Long dark eyelashes have long since been associated with femininity. Mascara and other beauty products make it possible to achieve this look but sometimes it all gets a bit too high maintenance. Mascara is tricky business and can take up a lot of time during your make-up routine only to end up giving you the spider lash effect. JinnyLash is a semi permanent treatment that involves attaching between 30-100 synthetic lashes onto the natural eyelashes. 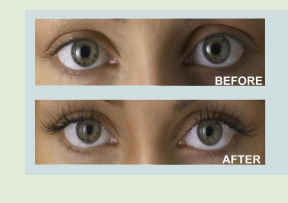 The end result is natural looking, fuller, longer and beautiful lashes. With the correct care the lashes can last several weeks, until they naturally fall out. The most important thing is that this JinnyLash doesn’t damage your natural lashes unlike some other extensions on the market and no mascara, eyelash tint or perming is needed because a natural looking C shaped curl means even those with short , straight or downward sloping lashes can achieve individual lashes that curl upwards. Prices charged are at the technician’s discretion but the JinnyLash centre (based in various department stores around the U.K) charge £150 for a full set and £80 for a half set with a retouch price of £1 per lash. JinnyLash recommend retouch treatments every two to three weeks but as the lashes are totally harmless and fall out with your natural lashes you can just go back when you don’t like the way they look anymore. It does seem quite pricey but then think of the money you will be saving on mascara and think of the extra half an hour in bed you will get every morning. Also, Cheryl Cole swears by them and who can argue with that!